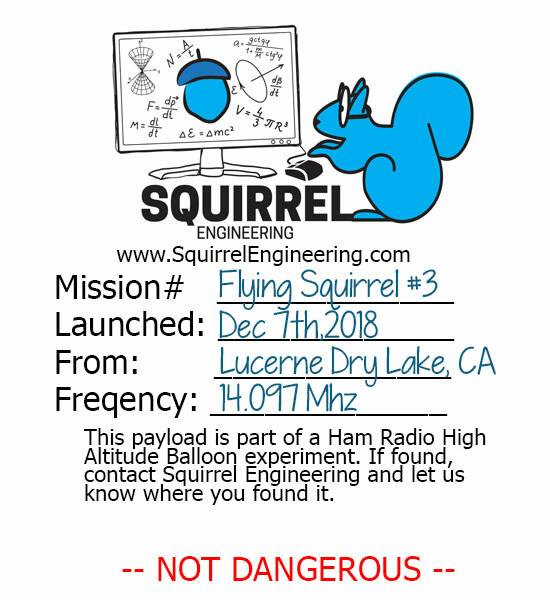 The Launch will take place at Lucerne Dry Lake Bed (Map) if the lake conditions are dry. If the lake is too wet/muddy for vehicle traffic, we will announce a new location over towards the Johnson Valley OHV Area to the East of the lake. All are welcome to attend at the launch site but be aware this is a desert area and appropriate precautions need to be taken, such as carrying plenty of water, sun screen, food, warm jackets in the case of cold weather. There are no bathroom facilities at the launch site, but some are available in the area. Ground conditions are likely be dusty. Very young children are not advised as there may be significant motorcycle & OHV traffic in the area. You are responsible for the safety of you and your family. If you are not able to attend at the launch site, there are other ways to participate from home. 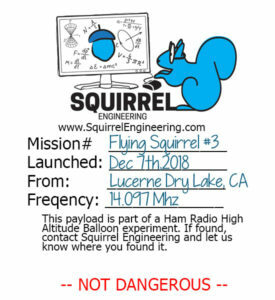 Monitor WSPRNET (Link) for the WSPR beacons sent by the balloon. Set the Map to the 20m band, callsign to KJ6FO and time period to 1Hr. A number of conditions may cause a postponement of the flight, mostly likely wind/rain conditions. For safety, the prevailing winds need to not be blowing Westward, so that the flight will not pass over densely populated city. Thus, dates are subject to change if weather and other conditions do not cooperate.